This is the first game in the Halo series. For other games in the series see the Halo category. Halo is an immersive war first-person shooter by Bungie Studios. 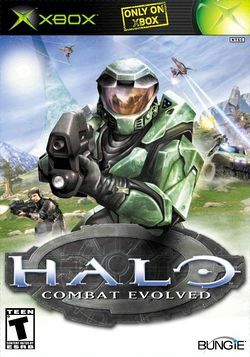 Originally planned as a real-time strategy game for Windows and Mac OS, the game eventually evolved into a first-person shooter exclusive to the Xbox. It has been awarded Game of the Year, Shooter of the Year and similar titles by various magazines. 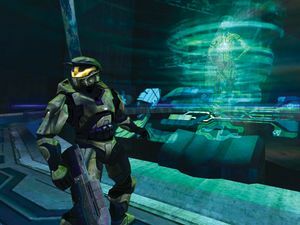 While the single player mode offers some unique and interesting storyline to players, it is the game's multiplayer mode is what really powers the steam-engine behind the hype of Halo. The Windows and Mac versions of the game features six new multiplayer maps, and new weapons and vehicles to the multiplayer mode, some of which were previously available only in certain parts of the single player missions. Halo has been released in several iterations on the Xbox, and later came full circle when it was brought back to Windows and Mac by Gearbox Software. Gearbox later released Halo Custom Edition, a multiplayer-only and modding-friendly build of the game; while free to download it requires a Halo CD key to install, unlike similar re-implementations such as Wolfenstein: Enemy Territory. Most of the more complex mods such as Halo 2 PC are made using Halo Custom Edition rather than the original port. On December 4, 2007 the Xbox version was released for the Xbox 360 via the Xbox Originals download service. This page was last edited on 16 August 2016, at 14:06. This page has been accessed 73,475 times.